Surface Cleaners - Cleans flat surfaces up to 10-times faster than with a wand! 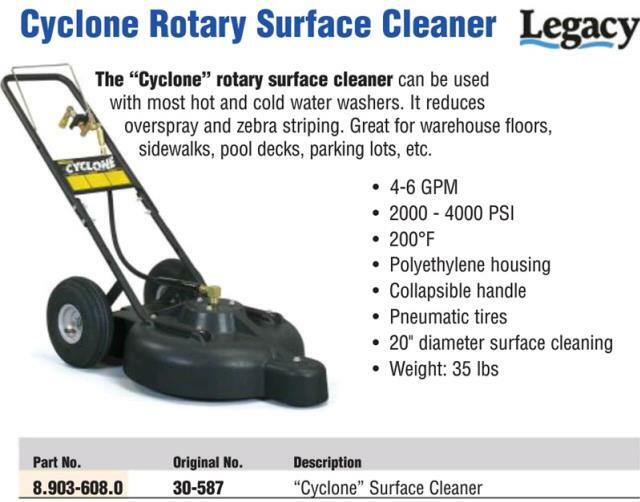 The Cyclone flat surface cleaner easattaches to a hot- or cold-water pressure washer (Minimum 3000 PSI & 3.5 GPM) and cleans flat surfaces fast, mowing grime from floors, patios and sidewalks. A rotary spray bar spins at 2000 RPM while the Cyclone seemingly glides across floors, patios and walkways riding on the evenly balanced tubed pneumatic tires and swivel caster wheel.